Tulane Stadium was an outdoor football stadium located in New Orleans, that stood from 1926 to 1980. It is officially the Third Tulane Stadium and replaced the "Second Tulane Stadium" where the Telephone Exchange Building is now located. The former site is currently bound by Willow Street to the south, Ben Weiner Drive to the east, the Tulane University property line west of McAlister Place, and the Hertz Basketball/Volleyball Practice Facility and the Green Wave's current home, Yulman Stadium, to the north. The stadium hosted three of the first nine Super Bowls in 1970, 1972, and 1975. The stadium was opened in 1926 with a seating capacity of roughly 35,000—the lower level of the final configuration's sideline seats. Tulane Stadium was built on Tulane University's campus (before 1871, Tulane's campus was Paul Foucher's Plantation, where Foucher's father-in-law, Étienne de Boré, had first granulated sugar from cane syrup). Since the institution of the annual Sugar Bowl game, Tulane Stadium itself was often informally referred to locally as "the Sugar Bowl". It was also billed as "The Queen of Southern Stadiums". It was in a portion of Tulane University's main campus in Uptown New Orleans fronting Willow Street, with parking stretching to Claiborne Avenue. The original 1926 structure was mostly of brick and concrete. The first Sugar Bowl game was played at the stadium on January 1, 1935, matching host Tulane against the Temple Owls from Philadelphia. The term "Sugar Bowl" had been coined by Fred Digby, sports editor of the New Orleans Item, who had been pushing for an annual New Year's Day football game since 1927. The Sugar Bowl proved to be a hit, and in response the north end was enclosed in 1937, creating a 49,000-seat horseshoe. In 1939, the north end and sides were double-decked, expanding capacity to 69,000. The south end was enclosed in 1947, expanding capacity to 80,735. A seating adjustment in 1955 brought the stadium to its final capacity of 80,985. In its final configuration, the stadium included four concrete and steel sections (separated at the corners of the field), with a short steel upper deck wrapping around the sides and north end of the stadium. The press box was located on the western side of the field, and the main gate (pictured above) was at the southern end of the field facing Willow Street. The support structure for the upper deck was entirely open, exposing the ramps and lattice work, and hiding the original brick facade underneath with the exception of the Willow Street end of the stadium. Lights were installed in 1957. The record attendance for the stadium was set on December 1, 1973, when 86,598 watched Tulane defeat in-state rival LSU 14-0, ending a 25-year winless streak for the Green Wave against the Bayou Bengals. It was the last installment of the LSU-Tulane rivalry played on the Tulane campus. Almost exactly one year later, Tulane Stadium hosted its final Green Wave game, a 26–10 loss to Ole Miss on a miserably cold afternoon on November 30, 1974. Tulane would not play another on-campus game until Yulman Stadium opened in 2014. One month after the Ole Miss–Tulane game, Nebraska won the final college game in the stadium, defeating Florida 13–10 in the Sugar Bowl on December 31. In addition to hosting Tulane University football games and the Sugar Bowl, the stadium was also home to the National Football League's New Orleans Saints for the first seven years of the franchise, from 1967 through 1974. The Saints' first home game was a 27-13 loss to the Los Angeles Rams on September 17, 1967, although New Orleans provided fans with a memorable highlight when John Gilliam returned the opening kickoff 94 yards for a touchdown. The Saints won their last game in the stadium, 14-0 over the St. Louis Cardinals on December 8, 1974. The largest crowd for a Saints game at Tulane Stadium came on November 26th, 1967 when 83,437 fans showed up for the first meeting of the Saints-Falcons Rivalry, which the Saints won 27-24. Tulane Stadium was the site of three early Super Bowls: IV, VI, and IX. Super Bowl IX was the final professional league game ever played at the stadium. The stadium hosted the two coldest outdoor Super Bowls, Super Bowl VI on January 16, 1972, at 39 °F; and Super Bowl IX on January 12, 1975, at 46 °F. Super Bowl IX was in fact originally scheduled to be played in the Superdome, but it wasn't finished yet. Aside from the various bowls, the most memorable moment at the stadium might have been the Saints victory over the Detroit Lions on November 8, 1970. In the NFL prior to the 1974 season, the goal posts were on the goal line instead of the end line. With seconds remaining, the Saints attempted a place kick with the holder spotting at the Saints' own 37-yard line. Kicker Tom Dempsey nailed the 63-yard field goal with a couple of feet to spare, and the Saints won the game 19-17, one of only two games the Saints won that year. That record would stand alone for 28 years before it was tied by Jason Elam of the Denver Broncos, Sebastian Janikowski of the Oakland Raiders, and David Akers of the San Francisco 49ers. Late in the 2013 NFL season, Denver Broncos's kicker Matt Prater finally broke Dempsey's record with a 64-yard field goal against the Tennessee Titans. In 1975, the day the new Louisiana Superdome was opened, Tulane Stadium was condemned. Upon appeal by the University, the older concrete and brick section was deemed fit to use, but not the newer metal seating section, which had rusted badly due to New Orleans' humid climate. The stadium then continued in more limited use for five years with the smaller seating area, used for football practice, high-school games, and other smaller events. ZZ Top played Tulane Stadium during its Worldwide Texas Tour July 17, 1976. Fans rioted and threw objects at police officers, prompting Tulane to ban any future concerts on campus, a ban which has extended to Yulman Stadium. Twelve years prior, Tulane had refused to host The Beatles on their second U.S. tour, forcing the band to play at the smaller City Park Stadium. The Denver Broncos used Tulane Stadium as its practice facility prior to Super Bowl XII, the first Super Bowl played in the Superdome. The last game played in the stadium prior to its demolition was between New Orleans Catholic League teams Chalmette High School and Jesuit High School on November 3, 1979. The final touchdown was on a 9-yard pass from Keith Mason to Craig Stieber with 4:08 remaining, helping Chalmette win by 23-9. On November 2, 1979, Tulane President Sheldon Hackney announced that the stadium would be demolished. The demolition started on November 18, 1979 and ended in June 1980. While the storage areas underneath the seating in the stadium were being emptied prior to demolition, various neglected University possessions were rediscovered, including an Ancient Egyptian mummy couple. The site of the former stadium is now home to the Aron and Willow student housing complexes, the Diboll parking structure, the Reily Student-Recreation Center and Brown Quad. Tulane Stadium is one of seven stadiums that had hosted a Super Bowl game which are no longer standing. Tampa Stadium, which hosted two Super Bowls, was demolished in April 1999; Stanford Stadium, which hosted one Super Bowl, was demolished and redeveloped in 2005–06; the Orange Bowl, which hosted five Super Bowls, was demolished in May 2008; the Hubert H. Humphrey Metrodome, which also hosted one Super Bowl, was demolished in March 2014; the Georgia Dome in Atlanta, which also hosted two Super Bowls, was demolished in November 2017; and the Pontiac Silverdome in suburban Detroit, which hosted one Super Bowl, was demolished a few months after the Georgia Dome in March 2018. The Tulane football team played in the "First Tulane Stadium" starting in 1909. The final season the team played at the stadium was the 1916 season. 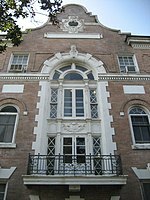 The Tulane football team played in the "Second Tulane Stadium", where the Telephone Exchange Building is now located, starting in 1917. The final season the team played at the stadium was the 1925 season. ^ Williamson, Samuel H. (2016). "Seven Ways to Compute the Relative Value of a U.S. Dollar Amount, 1774 to present". MeasuringWorth. To access, user must enter "1924" in the first search bar, enter "295968" in the second bar, enter "2015" in the third bar and click "Calculate". Retrieved April 17, 2017. ^ "Sugar Bowl History". Allstate Sugar Bowl. Archived from the original on 23 February 2007. Retrieved 5 December 2006. ^ Weather History Back to 1945 from the Farmers' Almanac. Farmersalmanac.com. Retrieved on 2013-07-29. ^ "A Tale of Two Mummies". Tulanian. 1999. Retrieved 2007-03-15. ^ a b "NOLA History – Football Stadiums". gonola.com. Retrieved 2018-03-10. ^ a b "The History of Tulane Stadium(s)". bestofneworleans.com. Retrieved 2018-03-10. The 1928 Tulane Green Wave football team represented the Tulane Green Wave during the 1928 Southern Conference football season. The 1933 Tulane Green Wave football team represented Tulane University during the 1933 college football season. The 1934 Tulane Green Wave football team represented Tulane University during the 1934 college football season. The 1935 Tulane Green Wave football team represented Tulane University during the 1935 college football season. The 1936 Tulane Green Wave football team represented Tulane University during the 1936 college football season. The 1937 Tulane Green Wave football team represented Tulane University during the 1937 college football season. The 1938 Tulane Green Wave football team represented Tulane University during the 1938 college football season. The 1939 Tulane Green Wave football team represented Tulane University during the 1939 college football season. The 1940 Tulane Green Wave football team represented Tulane University during the 1940 college football season. The 1941 Tulane Green Wave football team represented Tulane University during the 1941 college football season. The 1945 Tulane Green Wave football team represented Tulane University during the 1945 college football season. The 1946 Tulane Green Wave football team represented Tulane University during the 1946 college football season. The 1947 Tulane Green Wave football team represented Tulane University during the 1947 college football season. The 1948 Tulane Green Wave football team represented Tulane University during the 1948 college football season. The 1974 New Orleans Saints season was the team's eighth as a member of the National Football League (NFL). This was their final season at Tulane Stadium as the Louisiana Superdome opened the following season. They matched their previous season's output of 5–9. The team failed to qualify for the playoffs for the eighth consecutive season. Despite another losing record, the Saints defeated two of the NFC's four playoff entries, ousting the Los Angeles Rams 20-7 in week 10 and the St. Louis Cardinals 14-0 in week 13, both at home. The win over the Cardinals was the Saints' final game at Tulane Stadium. The Saints ended an 18-game winless streak on the road when they defeated the Atlanta Falcons in week six. However, they would not win again away from New Orleans until 1976. From 1972 through 1975, the Saints were 1-26-1 on the road.